Attending the Australian String Quartet’s performance of Schubert Ledger Shostakovich was almost like stepping back in time. 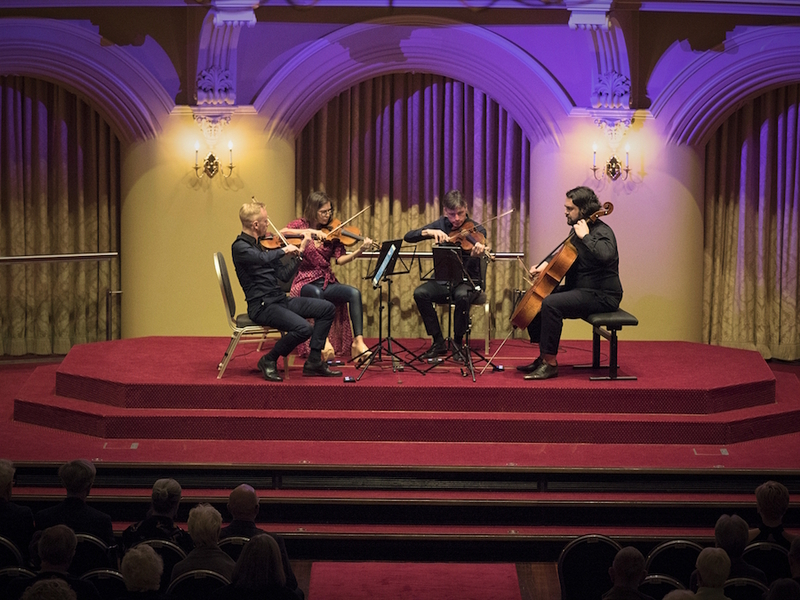 In the Government House Ballroom, with its high dome ceilings, classical symmetry and abundance of chandeliers and sconces, the ASQ presented its audience with the four, rare 18th century Guadagnini instruments secured on an exclusive loan from the UKARIA Foundation. But while the past was on display, so too was the present. Tablets replaced sheet music. a red dress brought vibrancy to the otherwise all-black concert attire of the quartet, and the String Quartet No 2 of Australian composer James Ledger – the second work of his to be commissioned by the ensemble – provided the meat between two canonised works of non-living composers. Watching the past and present interact and the relationship between the two unfold made for an entirely satisfying night of music-making by the ASQ. Schubert’s String Quartet No 13 13 in A Minor, or the Rosamunde Quartet, draws inspiration from multiple sources, including his incidental music for the 1823 play Rosamunde, Princess of Cyprus, and his own tortured existence at the time. The ASQ, as foreshadowed by Francesca Hiew’s introductory speech, chose to lean into the pain and anguish of Schubert’s diseased and depressed life, relishing the restless ebbs and flows of the first movement in powerful, almost symphonic gestures. Each Guadagnini instrument produced a distinct sound that set it apart from its siblings, yet the ASQ incorporated this into their playing, and were keenly aware of whose sound was to be followed and whose lines were to be engaged in conversation with. Though a few collection points were hesitant, and there was some disagreement on how themes passed between instruments should be presented, the ASQ was overall a united ensemble with much cohesion, as demonstrated in the impressive quick figures that passed through each instrument in the final movement. A highlight of this work was first violin Dale Barltrop’s sunny playing in the Andante, as he transformed what could have easily been a banal melodic line into a compelling recurring musical statement. However, the abundance of recurring themes could sometimes become a tiresome listening experience. It was an absolute privilege to witness the world premiere of The Distortion Mirror in Ledger’s own city of residence. Brilliantly building upon and deconstructing the essence of the string quartet – homogeneity, balance, dialogue – Ledger instructed each individually miked instrument to have their sound distorted and played back at them in electronic loops, creating an often unsettling and eerie sense of dialogue with unseen forces. The technical proficiency of virtuoso sound engineer Adele Conlin was crucial to fulfilling Ledger’s vision, manipulating acoustic sounds in real time and occupying a crucial position as the quartet’s fifth member. It was truly a shame Conlin wasn’t brought on stage to be acknowledged with the rest of the ensemble. It’s a testament to Ledger as a composer that the mastery of both electronic and acoustic forces was so seamlessly weaved together to fulfil the program of each movement, and the skill with which the ASQ responded to and joined the electronic sounds around them aided this integration enormously. Even in the sections deprived of electronic reverberations, Ledger demonstrated that he is a formidable composer for the string quartet, coaxing both lush Romantic sounds and eerily cold sonorities through a variety of string techniques executed expertly by the ASQ. For a while, one forgets that the ASQ is performing on such historical instruments. When the realisation arrives, the collision of old and new sounds becomes simply awesome. The concepts of opposition and duality that pervade the work of Ledger’s string quartet can also be found in the String Quartet No 10 of Shostakovich. Here we see a world split between the individual and the masses, the furious and the serene, the past and the present. Tinged with Baroque and folk flavours, Shostakovich’s Tenth Symphony, composed in 1964, allowed the ASQ to showcase their versatility, from the uneasy pastoralism of the first movement to the fiery rage of the second. Each player truly rose to meet the demands of Shostakovich’s score; in particular, the grittiness of Stephen King’s viola playing, and the regal serenity of cellist Blair Harris made for thrilling listening. Good concerts allow you to have a pleasant musical experience. Great concerts give you a musical experience that gets you thinking. The ASQ’s mixture of past and present musical resources, as well as the mind-bending work of James Ledger, certainly gave the audience much to ponder.